This guide will explain how to configure your Mac OS X 10.5 (Leopard) or 10.6 (Snow Leopard) operating system to be able to write using the Armenian alphabet. Your Mac OS X operating system ships with built-in support for Unicode, an encoding standard that allows your computer to handle texts in most of the world's writing systems. Because Unicode supports the Armenian script, your Mac OS X comes pre-installed with Armenian script support. To be able to write in the Armenian script, you must configure your Mac OS X with an Armenian input source. This in effect converts your existing keyboard to an Armenian one. For example, it can replace the “A” key with the Armenian letter “Ա”. 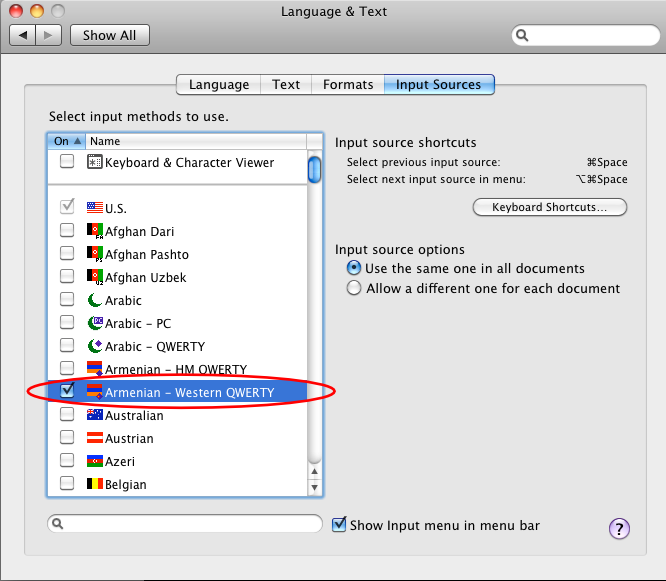 Select the checkbox next to “Armenian – Western QWERTY”. 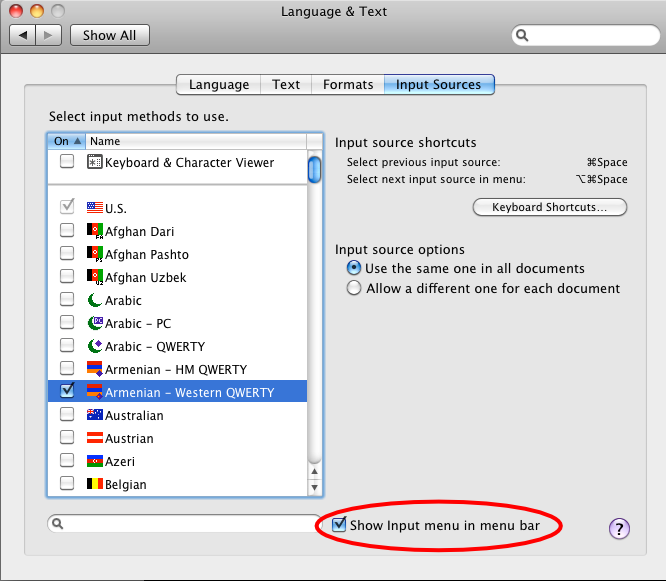 Another option is to use “Armenian – HM QWERTY” which requires you to use the “alt” key for some characters. Choose the input source for the language you'd like to type in from the Input menu (looks like a flag or character) in the menu bar. You might find it more convenient to use your keyboard to switch between layouts as you're typing. To quickly switch between input sources without using the mouse, press Command-Space bar. If Spotlight opens when you’re switching input sources, choose Apple menu > System Preferences, click Keyboard, and then click Keyboard Shortcuts. Select Spotlight on the left and deselect the Spotlight shortcut checkboxes on the right. Then, select Keyboard & Text Input on the left and select the “Select the previous input source” checkbox and the “Select the next source in Input menu” checkbox. From the Input menu (the flag icon), select "Open Language and Text..."
In the "Input Sources" tab, check the box next to "Keyboard and Character Viewer"
In the Input menu (the flag icon), select "Show Keyboard Viewer"